Tihemetsa Farm has been offering fish dishes for over 20 years. In spring, around April, the season begins with a smoked fish. The first spring speaker is a nice little fish Baltic herring. It is also possible to get flounder, perch, and, if the sea is kind, the eel. We smoke until autumn. Hot smoked fish can be eaten directly from the smokehouse and on the spot. You can also buy fish on request. In this case, you will get warm fish an agreed time. When the weather and winds are favorable we make fish every day. The whole process of fish cleaning, salting and smoking is done manually on the spot. It is a family business. Every spring we host schoolchildren who come on foot from Kuressaare to get to know fish and fish smoking. We have a small dining room for up to 45 people. We have no portions and everyone can eat as much as they want. Usually we have on the table smoked fish, boiled potatoes, cream sauce, green salad, bread and different fish culinary, cake, coffee and tea. If necessary, we make the menu at the request of the customer: there is also the possibility of an eels. If desired, an accordion player can greate the mood. She plays and sings in Finnish, German and Russian. 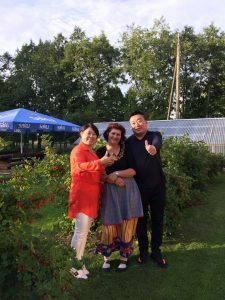 You are most welcome to our farm and home restaurant in Nasva, Saaremaa.